Heck's Kitchen | "What is this place, a restaurant? Am I in Hell? No, I'm in Heck!" Heck’s Kitchen is here to share ideas about food, friends, parenting, and cooking at home. The first and most important parts of that is having a home and family to cook for. We’re certainly blessed with both. The next key ingredient is having a serviceable kitchen that meets the needs of the chefs who fall into Heck. That’s the immediate plan. 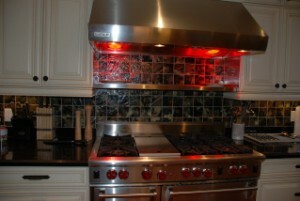 The first phase of our web site will take you through how we got to a first rate home kitchen. Check out the current state andproject discussions. We’re about to start up the Heck’s Powder Room project. Stay tuned. We’d also like to add a big Mahalo to Matthew and Keira here in Oahu for taking us around all the cool Local Food grinds. I think Kris and I did ok, for a pair of haoles. Heck’s Kitchen started with an idea. A bizarre and twisted one. But then, I’m Chef Randy, and I’m used to the bizarre and twisted. On a dark and blustery winter evening, my elder son Joseph declared that he was giving up on the sciences in favour of becoming a chef. He’d been watching me in the kitchen for years and wondered what all the flurry and flour and flinging was all about, and found that he had a decent sense of flavour and taste. In an attempt to see whether he was even a little serious, having no real feel for what being a chef is all about, I sat him down in front of the television to watch Hell’s Kitchen. At the least, it would teach him about the expectation of perfection, immaculate presentation, and uncompromising freshness, which has become part of the ethos and mythology associated Chef Gordon Ramsay. At worst, it would scare him off and send him sneaking back to science and math. At best, he would learn as much as he could to make a good decision about his future. What none of my family realized was that we’d all become wrapped up in his passion and embrace it. This site is then, dedicated to the passion for food and family that we all have and bring to the table. In order words, what’s the Heck’s Kitchen mission statement? We’re here to bring families together through food, family, and fun. If sharing some of our experiences can help you do the same as we’ve been able to do, we’ve succeeded. If you have something that can benefit everyone, please let us know, and we’ll test it out in the official Heck’s Kitchen testing process (more to come on that soon). The Heck’s Kitchen logo first appeared in a sillier font when we started. The lettering should be obvious. The whisk in the centre got added when we launched the web site. It’s a fairly old style wooden Chinese whisk (if someone knows the origin, please let us know) and serves as both a whisking and ladling utensil. Having items that perform more than one task in our kitchen is part of my own design philosophy. By having multi-purpose tools, you can save on a lot of space. Our oven is another example of that, but we’ll go into that on the renovation equipment page. Obviously, we wanted to avoid any confusion, either direct or implied, with Hell’s Kitchen, with which Heck’s Kitchen has no affiliation whatsoever. Forks, pitchforks, flames, block letters, burning letters, were obviously out of the question. As if this whole concept wasn’t funny enough on its own, we’ve been trying to keep things light and funny. The critterspage is dedicated to humour and silliness and the idea that we can actually make fun of the renovation process. Once we’re done the renovation, those critters are going to be on the menu! Hopefully you’ll enjoy it. Thanks go out to all who contributed ideas. Our site is currently organized around the upcoming renovation. Please consult our contents page for the structure of our website. After we’re done with that, we’ll probably restructure the pages around what’s actually going on at our place, plus recipes and tips. Heck’s Kitchen is the creation of panicking parents looking for ways to entertain, engage, teach, learn, and enjoy time with their children, and not always succeeding, of course. Recipes posted on this website, as it evolves, have been tested in the Heck’s Kitchen test kitchen, but your mileage may vary. Nutritional information supplied with any recipe will have sources quoted. Remember, recommended daily allowances very from country to country. Even nutritional content can be different depending on the formulations used. That’s one of the key reasons we try to avoid pre-packaged foods. Any resemblances to any television programs or previously published recipes are purely accidental and unintentional. We do take pride in everything that is created in Heck’s Kitchen, and that extends to protecting published intellectual property and copyrights.